The Honda Navi is a bit of an oddball for a company that likes to play it safe, especially in India. It straddles the twilight between the scooter and motorcycle worlds. The chassis is, for all practical purposes, all-new and the engine is the 110cc single from the Activa down to the variomatic transmission. 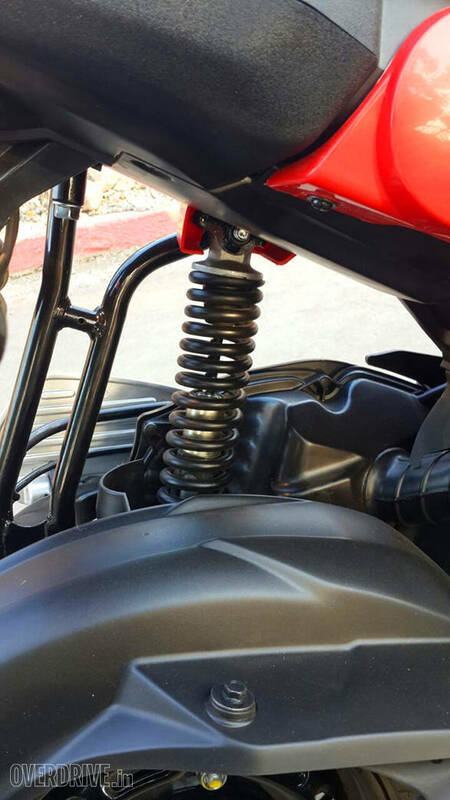 The motorcycle-like element is the tank and seat configuration while leaves a gaping hole underneath because the scooter engine is set farther back than usual for a motorcycle. This space is interesting because it has utilitarian as well as customisation possibilities. 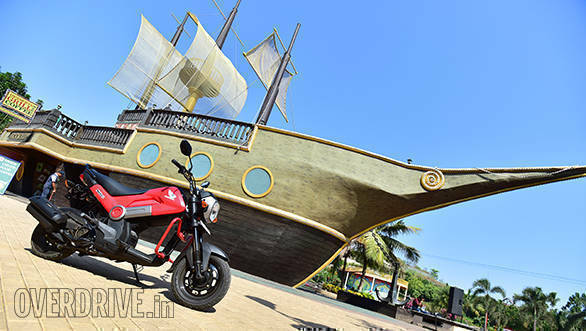 The Honda Navi looks well made but the design is cheeky, playful and even cheesy in parts. Overall dimensions are similar to the Honda Activa but the slight length and wheelbase advantage the Navi has is hidden by the visual diminution of the design. Seat height is the same as the Activa but the Navi is a bit larger in every dimension. The front USD forks are cute and the rubber gaiters on them are practical, but on our long termer, they're coming off for sure. The headlight area is surrounded by an ocean of plastic but it sets the cheeky tone for the scooter. Scooter? Well, Honda doesn't technically qualify the Navi as one or the other but one of the warning stickers on the Navi clearly says, "This scooter is..." We'll take the hint and run with it. The tank ends in a circular element that almost suggests a hinge and it's odd visually but central to the design. After that lies the seat and relatively little bodywork that ends in a reasonably simple tail light and laughably small saree guard of sorts. Honda will offer colour-matched crash guards and a whole host of accessories to allow fairly wide ranging customising options. In fact, Honda say that an affordable price and reasonable prices for customisation options were both crucial parts of the design. Indeed, the entire set of options, if specified, on a fairly lurid looking Honda Navi on display would only set the customer back a mere Rs 6,000. That's impressive. 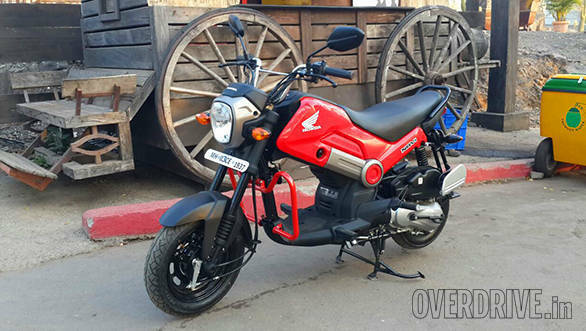 The Honda Navi's engine is the 110cc unit from the Activa. So I was expecting the scooter to be fairly mild. But it has lost 7kg over the Activa and that puts a distinct zing into proceedings. Riding inside the lanes of the amusement park, top speed was just 60kmph but the way the Navi gets there will put a smile on your face. It's peppy, responsive and more than a little cheeky. What is the actual top speed? Well, I'll be riding the Honda Navi to Mumbai later today and I will update the story with a speedo reading once I have it. 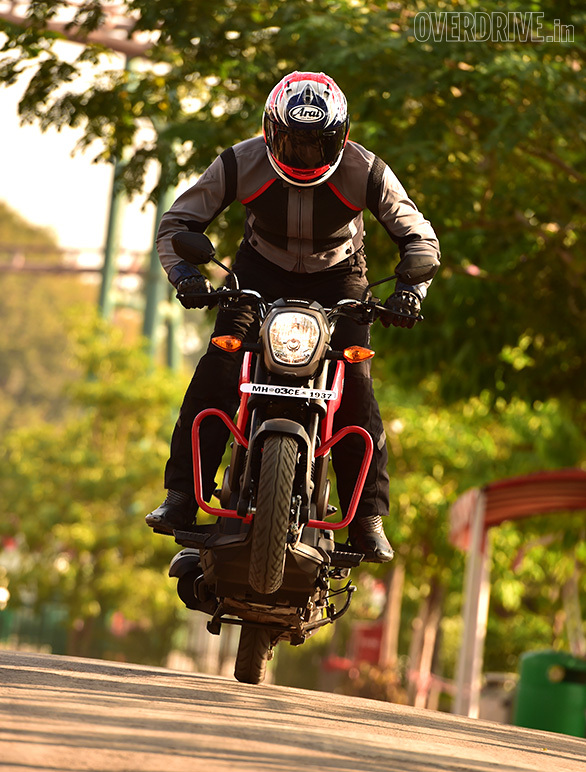 The feel of riding the Honda Navi isn't dissimilar to the Activa in many ways. It feels light and agile but the weight distribution is different. 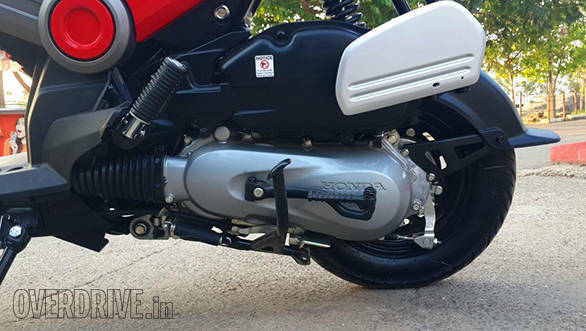 With a little effort, the Navi will lift its front wheel off the ground happily and that's a surprise. 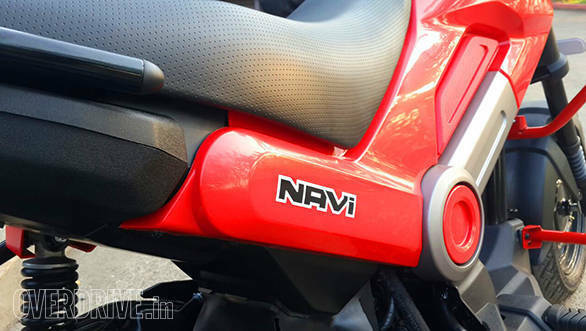 I'm beginning to understand that Honda's fun-oriented marketing for the Navi isn't just a spiel, it's real. Hey, that rhymes! Handling is neat. No surprises there - this is an Activa frame. The underbone is the structure and under the fuel tank is a bracket that is only used to mount the tank and its plastic covers. 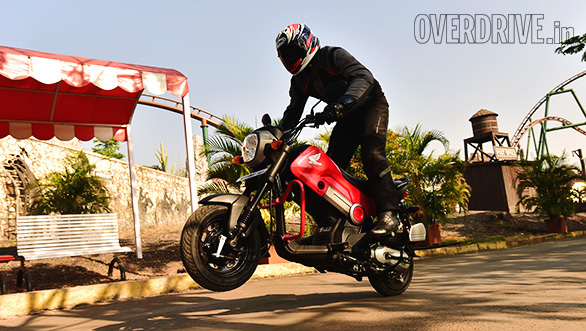 Honda couldn't tell us immediately how the weight distribution has changed but you can feel that the front is lighter than the Activa - hence the wheelie action. Ride is firm and well-damped but despite 20mm more travel from the front upside down forks, the Honda Navi doesn't like bumpy going, especially at a fast clip. Push it and you'll feel that unsettled movement which is fair warning. Brakes are strong as scooter drum brakes tend to be and Honda has left on the rear brake lock which is always a good thing. 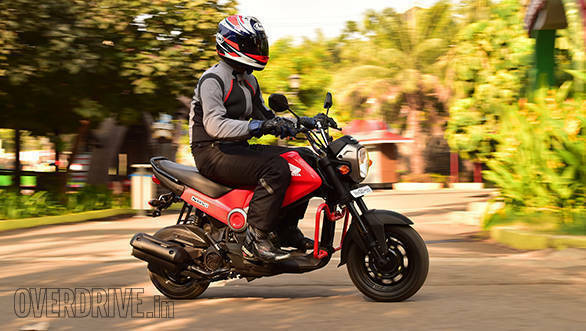 The Honda Navi is priced at Rs 47,836 on-road Mumbai and it is a good little scooter for the price. It works well, is genuinely fun to ride and surprisingly peppy too. The cost focus does rear its head here and there. The gas tank cap and its cover are both flimsy and cheap looking for instance. And more than one journalist pointed out that the handlebar looks like a moped handlebar. But you know what? It doesn't bother me one bit. The Navi is the most fun Honda on the market right now and I love its cheek and attitude. This is going to be a fun test and one of the most popular long termers in the OVERDRIVE garage. The reason is simple. The Honda Navi strips away many layers of adulthood and turns us into naughty children at the turn of a key. Now. When can we get one with the Unicorn engine, eh?